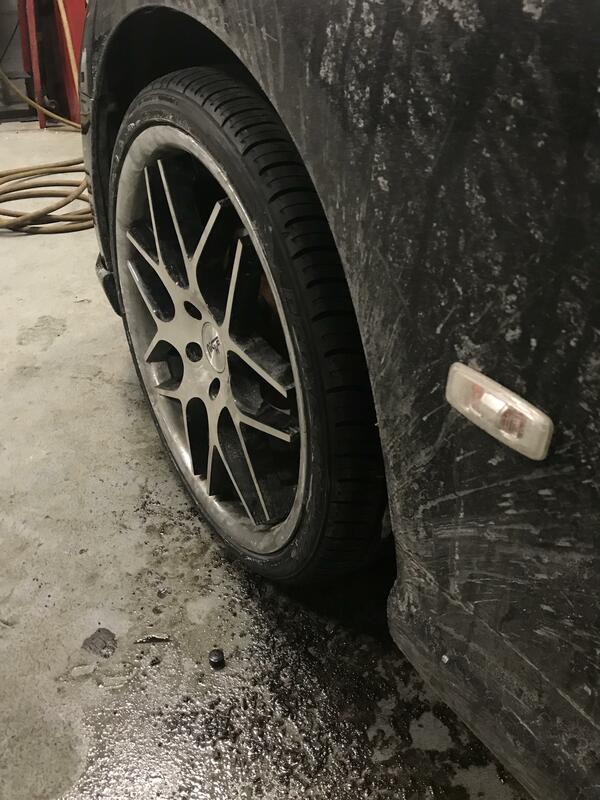 My m45 came to me with aftermarket 20” wheels. The fronts are about 9” and the rear are about 10.5”. These are measured with a tape measure through the wheel, so not exact. I deducted 1/2 inch from the tape reading to make up for the outside measurement. I don’t know what the offset is. The front (9”) wheels have 225/35, and the rear (10.5”) have 275/35. The rear barely fit inside the wheel well, and the front 225s stretch dangerously to fit the wheel. Is anyone else running a similar setup, and if so, what tire sizes are working for you? I’m not a real fan of two different sizes, but I really don’t want to shell out the cash for new wheels either. Welcome to the forum. I believe the M45 models came with 18 x 8" or 19 x 8.5" wheels with +45 offset. 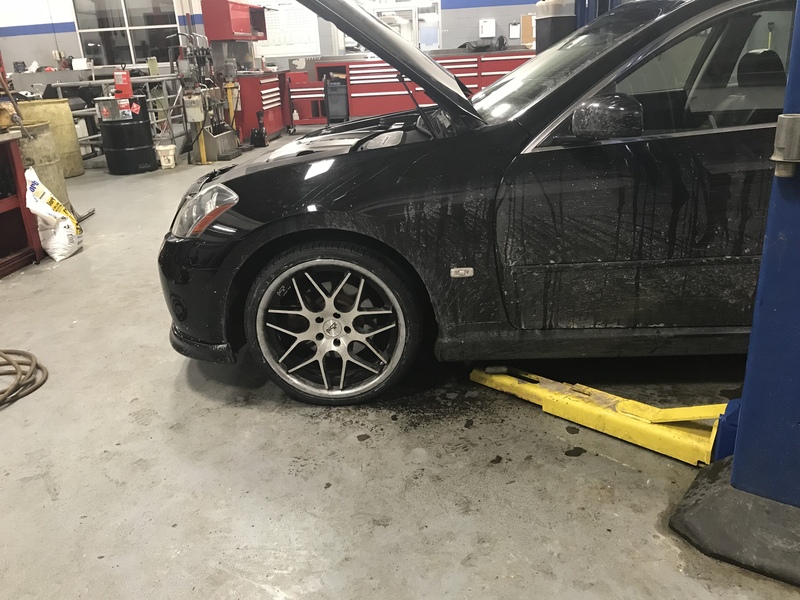 There is no way to determine if the aftermarket wheels are safe / proper until you can determine the actual offset of those particular wheels. Sounds like the previous owner may have been more focused on appearance than a proper ride. Perhaps another member may have some input regarding over-sized wheels but I'm afraid you may need to re-do the wheels / tires. I am running 19 x 9 " +45 offset wheels with 255/40/19 tires and I absolutely love the grip and performance. Maybe you can do just one axle at a time to avoid spending so much all at once. I found four 18x9 universal 114.3/120 x5 wheels for sale. Offset +35. They have Nissan sensors in them. Would this offset work, and will an 18” wheel work on the m45 Sport. Wheels made by XXR. I found out my wheel axe/offset. The front are 8.5” wide with 35 offset. The rear are 10” wide with 40 offset. I decided to keep this arrangement, and had new tires (255/30/20 Toyo Proxes Plus 4) installed on the front. I used a tire size calculator I found online to determine what the overall diameters would be with any given tire size. A will be putting 275/30/20 on the rear, and overall diameters will be nearly identical. The car handles much better now, having gotten rid of the stretch fit that was up front. My future Son-in-Law works for, and is friends with the owner of a Ford dealership, so he (I) get tires at cost, plus use of the shop after hours. I included a couple before and after pics. You will also notice what an afternoon of Wisconsin driving can do to dirty-up a car. 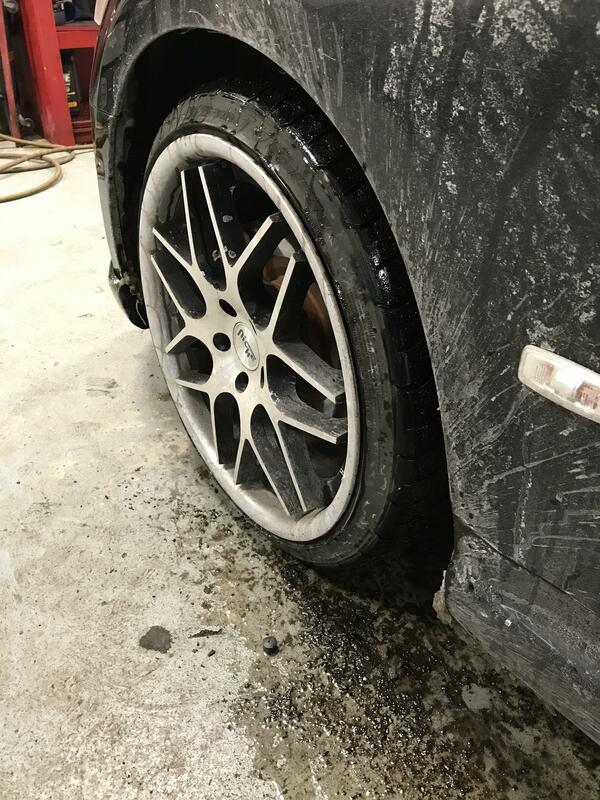 Our cars staggered you want 20x9 in between +20 up to +25 to get your front flush and able to clear big brake kit if need be. Rear 20x10.5 +30 up to +45. My set up is 20X10.5 Front rear +30 front +35 rear clear my big brake hit 255/35 front rear. <cringe> Please, on all that is holy ............. WASH THE CAR !!!!!!! Typically you would see small width tires that are stretched like that for drift use, especially with the super low profile like that, so the sidewall doesnt flex when you are taking turns really hard. Though only a couple people in the world probably have such a use on these cars (Chris Forsberg being the only one I know for sure). And to stretch up front and not in rears? IDK, I could kinda sorta imagine that maybe they were trying to get better MPG by having less tire on the road so less resistance? Defeats the purpose IMO by having rears as 275's though. Also defeats the purpose having 20"ers on the car. Adding a couple extra pounds per rim from the larger size drops you at least 1mpg just right there. its also kinda dangerous to have that small of tires on the front because the weight rating isnt enough for this car. Actually, that is just after a wash. It got that dirty from a day of driving before the tire change at 6pm that night. As far as performance goes, these really made a huge difference. Cornering is much better, and the ride is greatly improved. Also, you can probably imagine how the stretch performed in the snow. The car was pretty well useless on an unplowed or slushy road. I am quite happy with the Toyo Proxes in the snow. They do better than I thought they would for such a wide tire (255).